4. HRO Scenario...fact or fiction? 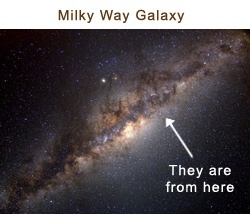 5000 years ago, there existed a small civilization of Homo sapiens living on an earth-like planet within our Milky Way galaxy. They had very similar social structures to our own, such as, government, business, community, education and family. They also had similar laws, freedoms, institutions, languages, insights, amenities and aspirations. However, they were all avowed atheists, who regarded angels as loving fairies of righteousness, who pranced around in children’s stories and nursery rhymes. Archival video recordings from this period would resemble the Czech Republic, circa 2005. 4802 years ago, a few wealthy corporations colonized a nearby planet in their solar system, which kicked off a long, harrowing Gold Rush frenzy of unbridled greed and power grabbing. This event caught most of the politicians flatfooted. So, they set out to pass new laws to try to handle the growing security issues which had ensued, but in time, these proved to be increasingly autocratic and problematic. 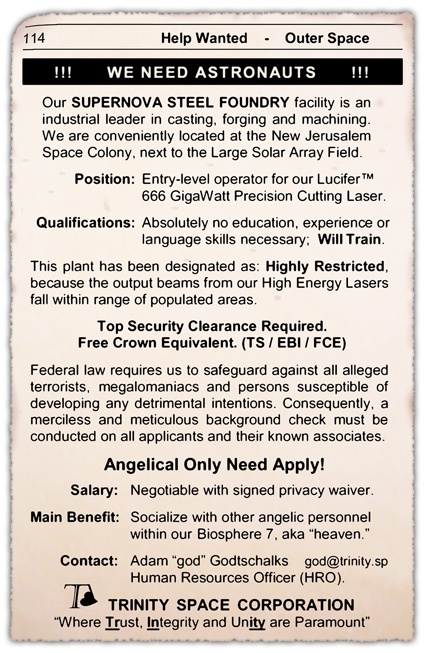 4800 years ago, Adam “god” Godtschalks was a talented and decidedly imaginative Human Resources Officer (HRO) for the Trinity Space Corporation (a large faceless company), who had been running the usual print advertisements (below), but with mounting unease. After talking with his superiors, he was given additional latitude to develop new options and strategies for employee recruitment. In time, Adam decided to abandon this old “tried and true” method (the classifieds) in favour of a new process. This was primarily due for two reasons. He discovered that most applicants were grossly padding their résumés over the increasingly critical issue of ethics and moral fortitude. The background checks and psychological profiles being conducted on his applicants were hopelessly inadequate. Adam was genuinely concerned over mounting lawsuits from victims’ families, due to the actions of a few of his mischievous, former space workers—especially the laser operators. Adam’s new recruitment tactic was to deploy Anonymity Biospheres (AB’s). This had been an idea of his for months. He felt it was time to exchange the old overt methodology, in favour of a covert approach, which would be more reliable in gauging every applicant’s core values, grudges, alter egos, will to power, homicidal tendencies, deep-seated delusions of grandeur and other important attributes. He hired some creative fiction writers to hammer out the first draft of his AB delineation script and successfully sold it to his superiors as a better way to find suitable employees. No one denied that it would be expensive and protracted, but it was accepted as merely the cost of doing business in the new reality of the space age. Adam’s AB solution caught on quickly with all the other spacefaring corporations, which began setting up their own AB structures within their HR departments. Opportunely, for these multinationals, their AB operations were conducted in private space colonies—far away from the prying eyes of the media and equally curious general public. 4796 years ago, a global congress was hastily convened to address the growing concern over the forecasted Age of Utter Defenselessness (AUD). There was widespread belief that this new era would be arriving soon and that steps should be undertaken beforehand, as a necessary precaution. 4791 years ago, a newly elected One World Government purchased all existing AB’s and placed them under their sole control and jurisdiction. All the previous owners agreed to the sale because it became clear that capitalism would have to be replaced outside the AB’s. The new currency would have to be angelic love if their species was to survive itself in the AUD. It seemed that some of the old fairy tales were coming true, after all. 4760 years ago, the first batch selection of AB selectees took place and all the chosen individuals were seated at the head of government—for life. They were given a brand-new lavish Upper Tier (UT) and a contemporary education. 4755 years ago, the new administration reaffirmed the policy of a two-tiered social structure of AB’s and a UT for their species. 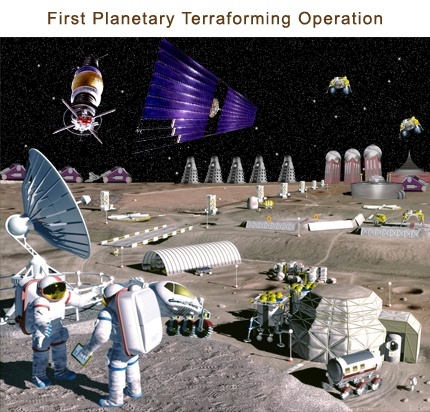 They then sent out trillions of self-replicating robots to terraform other planets in their galaxy for the expressed purpose of AB construction. 4500 years ago, the technology of resurrection was discovered and implemented. This new development altered the AB delineation script. 4301 years ago, Robot Probe # 72135257231451304569 discovered a new planet and designated it for terraforming. It was a cold and desolate place, similar to Europa, but it had advantageous features, which made it suitable for habitation such as ice, minerals, sunlight, appropriate gravity, etc. The terraforming process took the standard six days to complete, utilizing the usual 872,419,232,305 nanobots and megabots. This newly terraformed planet is known today as the Earth. Unsurprisingly, the finished results appeared to be anything but terraformed (to the naïve), with ample fossil props and other artifacts (intimations of natural selection, etc.) to promote an atmosphere of complete anonymity. 4300 years ago, the first people arrived on the new earth to begin the first AB cycle. These actors were Noah, his wife, his three sons and their wives. The first true evaluees were designated as Noah’s grandkids. As these infants grew up, they were given false information about the history of their planetary civilization, such as, Adam and Eve, the Garden of Eden, the Fall of Man, the Curse, the Flood, etc. This was to allay their fears and curiosity about their origin and to speed up the evaluation process. It was all part of the updated AB delineation script. The moral of the story is if we are inside an Anonymity Biosphere (AB), it would be very easy for any advanced transcendent intelligence to play us all like a fiddle. In addition, perhaps God is a rational pragmatist, operating exclusively within the practical realm—not outside time and space. Contrary to popular belief, philosophers are not devoid of humour. It’s just that sometimes it’s too wry to be widely perceived.